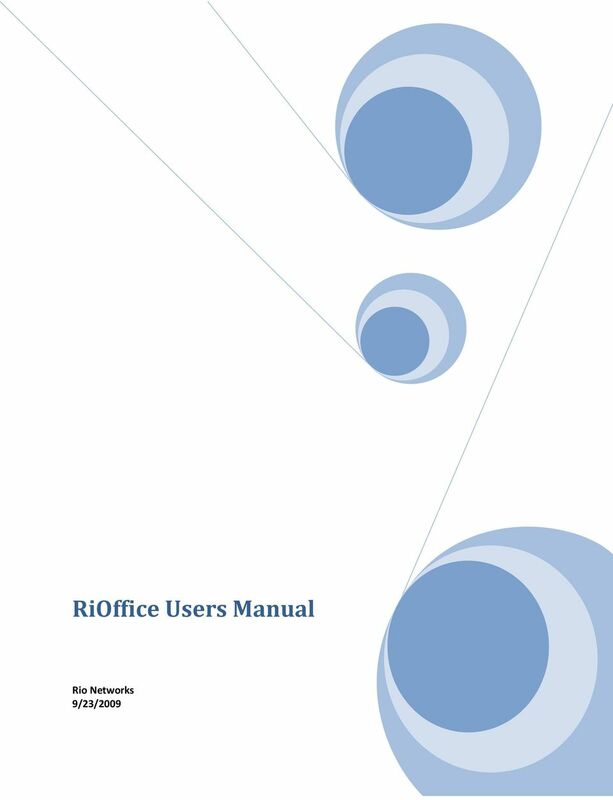 9 Voic Each extension within the Rio Office host PBX comes with a voic box by default. 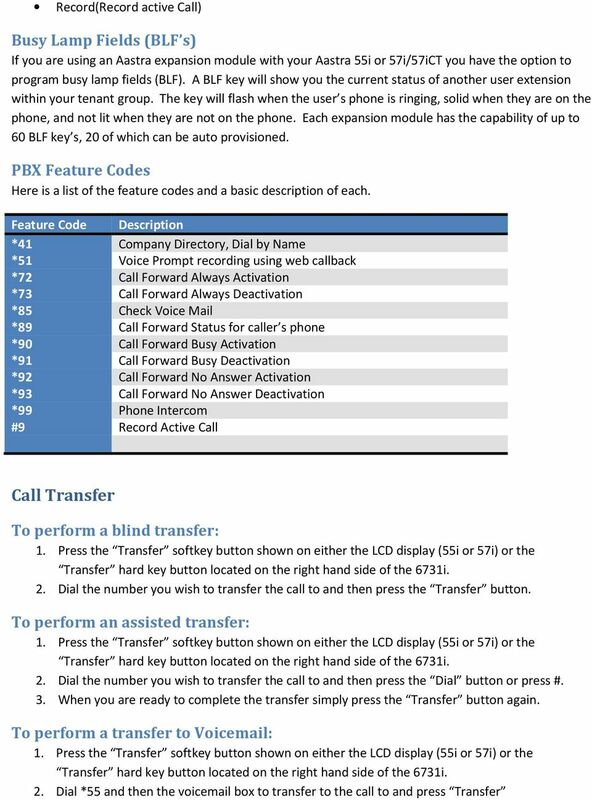 To login to your voic simply press the Voice Mail button on your phone, or if you are remote you can dial your DID number and then interrupt your greeting by pressing *. The system will then ask you for your password; dial your pin and then wait for the system to give you instructions. 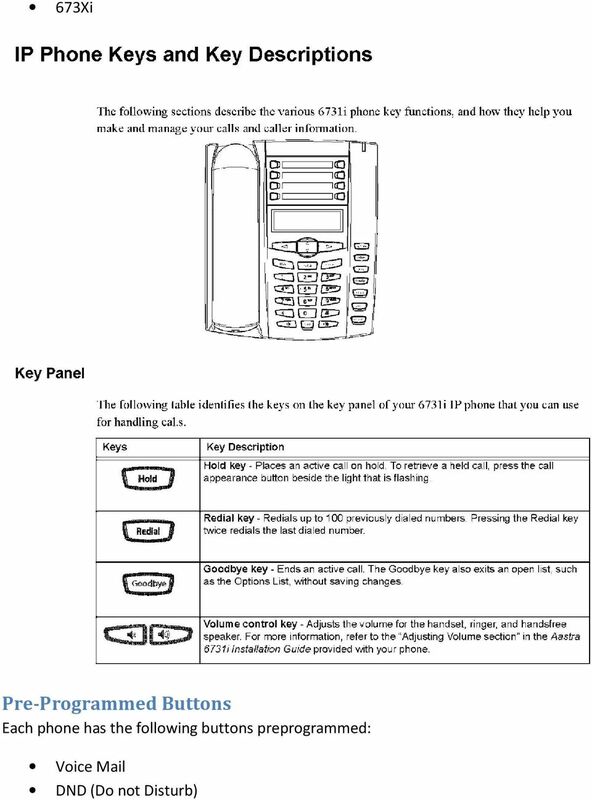 Setup your Voic Box Here are the instructions for setting up your voic for the first time. Login to your mailbox by either pressing the Voice Mail button or dialing *85. Press 0 for mailbox options To record an unavailable greeting press 1 o After the prompt say your greeting and press # o To accept the greeting press 1 o To listen to your greeting press 2 o To Record press 3 To record a busy greeting press 2 o After the prompt say your greeting and press # o To accept the greeting press 1 o To listen to your greeting press 2 o To Record press 3 To record your name press 3 o After the prompt say your greeting and press # o To accept the greeting press 1 o To listen to your greeting press 2 o To Record press 3 To Change your PIN press 4 Managing Messages Login to your mailbox by either pressing the Voice Mail button or dialing *85. Press 1 to listen to your messages After listening to the message you can use one of the following options o 5 to repeat the message o 6 to go to the next message o 7 to delete the message o 8 to forward the message o 9 to Save To play message information such as the caller id of the person who left the message and the date and time it was left press 3 then 3 to play the envelope information. 12 Voic Settings PIN: Personal identification number for accessing voice mail. Notify by Check this if you would like to be notified about new voice mail messages via . If this is checked, then address is also required. address: Your address. 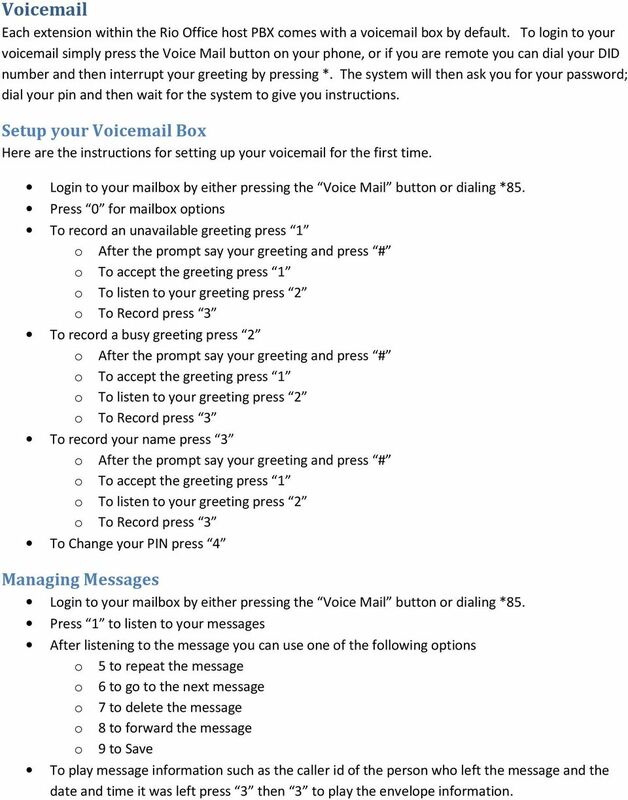 Attach messages to Check this if you would like the voice mail messages to be attached to the notifications. Delete after delivery: Check this if you would like voice mail messages to be deleted after they are delivered via . 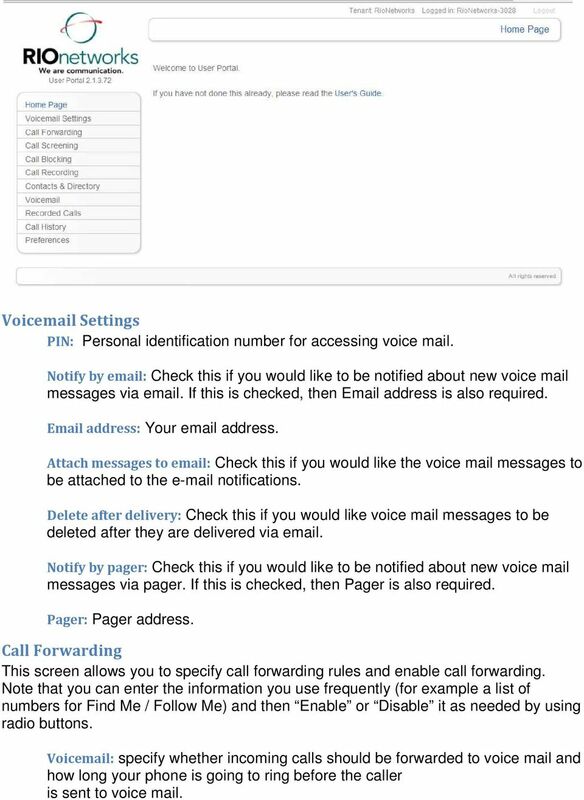 Notify by pager: Check this if you would like to be notified about new voice mail messages via pager. If this is checked, then Pager is also required. Pager: Pager address. 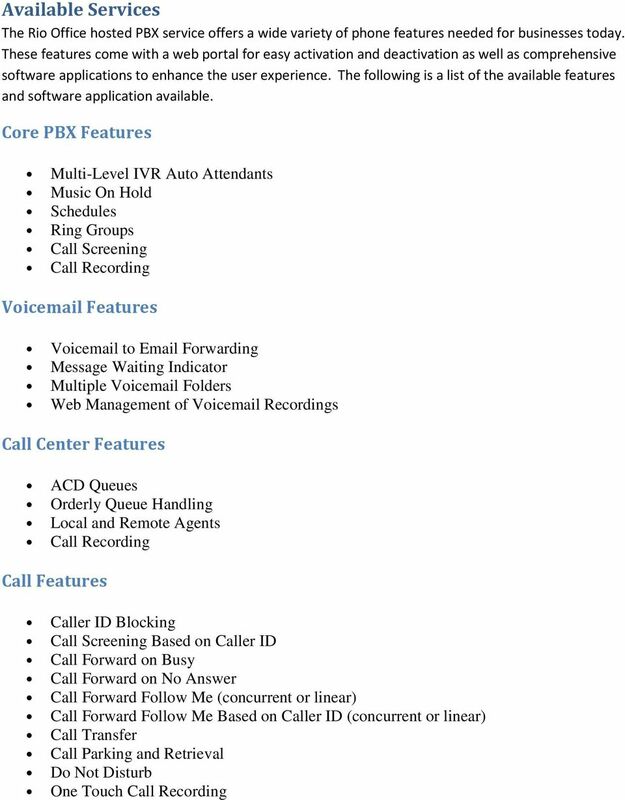 Call Forwarding This screen allows you to specify call forwarding rules and enable call forwarding. Note that you can enter the information you use frequently (for example a list of numbers for Find Me / Follow Me) and then Enable or Disable it as needed by using radio buttons. Voic specify whether incoming calls should be forwarded to voice mail and how long your phone is going to ring before the caller is sent to voice mail. 13 Call Forwarding Always: allows you to forward all your incoming calls to a different phone number, such as your home office or cell phone. Note that if Call Forwarding Always is enabled it will take precedence over Find Me / Follow Me. You can also set the phone number to forward using by dialing feature codes. *72 Activation *73 Deactivation Call Forwarding Busy: This option allows you to forward all your incoming calls to a different phone number if your phone is currently busy. Use this when you would rather have a co-worker receive the call instead of the caller being sent to your voice messaging box. You can also set the phone number to forward using by dialing feature access code. *90 Activation *91 Deactivation Find Me / Follow Me: This option allows you to try forwarding your incoming calls to a different phone numbers. You can specify up to 5 phone numbers which can be either dialed at the same time or sequentially. You can specify whether the phone associated with your extension will be called or not, and whether the numbers will be called simultaneously or one after another. You can enable Find Me /Follow Me for all callers or that calls only from certain callers be forwarded and enter caller ids of these callers. You can also set one phone number to forward using by dialing feature access code. *92 Activation *93 Deactivation Call Screening This screen allows you to specify call screening rules and enable call screening. You can specify call screening options for calls with or without a caller id. For calls with caller id you can request that the callers announce themselves. You can also enter a list of caller ids for the callers you would like to exclude from screening. For calls without caller id you can request that the callers announce themselves and/or enter their caller id. You can combine Call Screening with Find Me / Follow Me. If you would like to hear callers' announcements while receiving a forwarded call you should check Play caller announcement while in follow-me mode. Note that you can enter the information once and then Enable / Disable call screening as needed. Call Blocking This screen allows you to specify call blocking rules and enable call blocking. 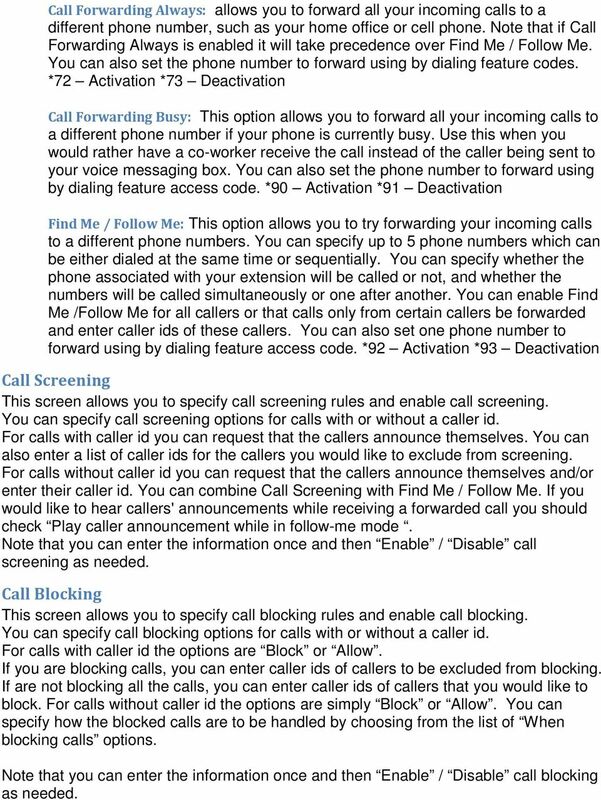 You can specify call blocking options for calls with or without a caller id. For calls with caller id the options are Block or Allow. If you are blocking calls, you can enter caller ids of callers to be excluded from blocking. If are not blocking all the calls, you can enter caller ids of callers that you would like to block. For calls without caller id the options are simply Block or Allow. You can specify how the blocked calls are to be handled by choosing from the list of When blocking calls options. Note that you can enter the information once and then Enable / Disable call blocking as needed. 14 Call Recording This screen (if enabled) allows you to specify whether the calls to and from your extension will be recorded. Note that this option may be disabled by your system administrator and this screen will not be available. 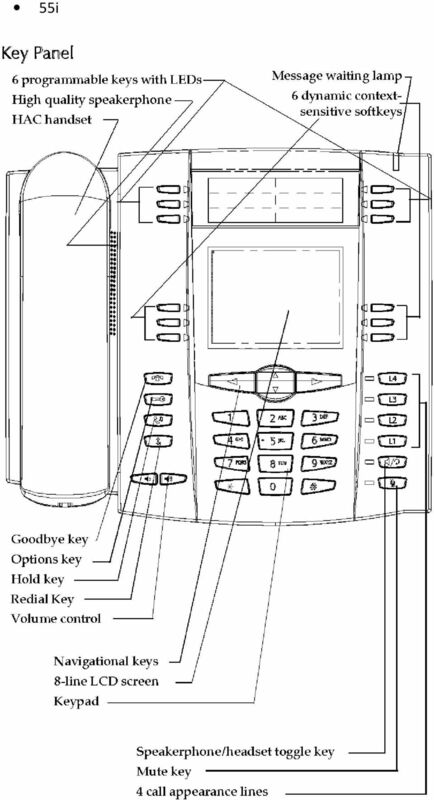 The options are to record all calls, not record calls or record calls selectively by pressing a key sequence. By default this key sequence is #9. Contacts & Directory This screen gives you access to contacts stored in the office directory and personal contacts and allows you to initiate calls from your phone using click-to-call feature. Selection Filter: allows you to quickly find directory entries based on Last Name, First Name or Department. For each of these fields you can specify whether you are looking for an exact match or entries starting with or containing the specified string. If multiple fields are specified all of them are combined in the filter. You can switch between your Personal Contacts and Company Directory by checking an appropriate option and clicking Select. Call Contact: To call a contact, select one of his/her phone numbers from the drop down list in the Phone column, and click Call. Your phone will ring and when you pick it up you will hear it ringing your contact's phone. Manage Contacts: While in Personal Contacts you can create additional Contact records by clicking Create Contact button. To delete a Personal Contact select it using the check box on the left and click on Delete Selected. Voice Mail This screen allows you to manage your voice mail messages. Listening and Deleting Messages: To listen to a voice mail message click PLAY, and the message be downloaded and played (provided that you have appropriate player software). 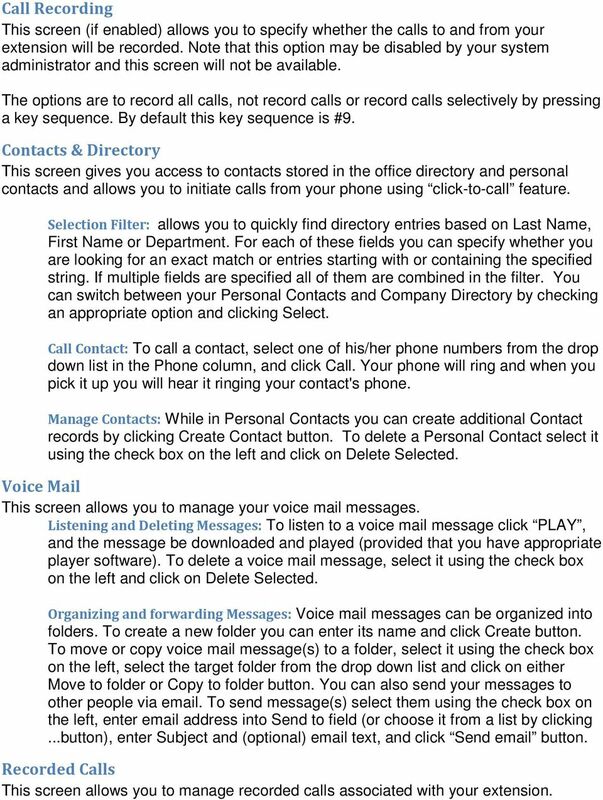 To delete a voice mail message, select it using the check box on the left and click on Delete Selected. 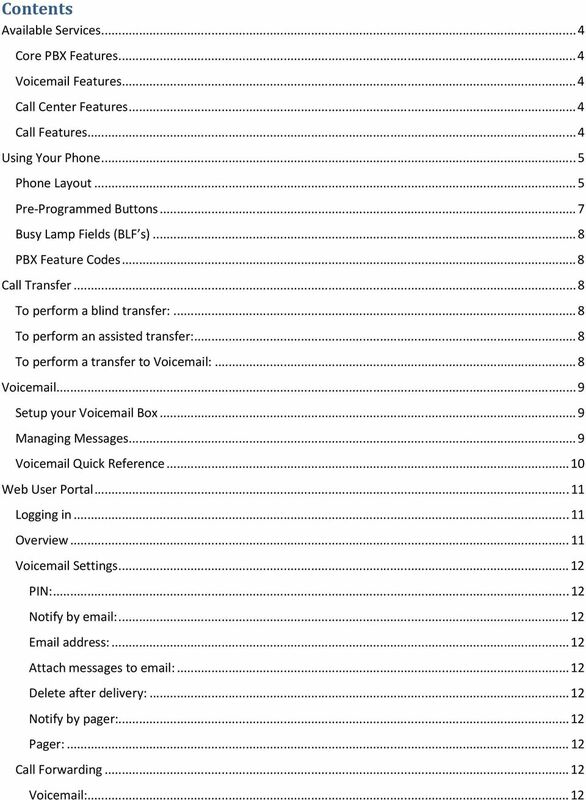 Organizing and forwarding Messages: Voice mail messages can be organized into folders. To create a new folder you can enter its name and click Create button. To move or copy voice mail message(s) to a folder, select it using the check box on the left, select the target folder from the drop down list and click on either Move to folder or Copy to folder button. You can also send your messages to other people via . To send message(s) select them using the check box on the left, enter address into Send to field (or choose it from a list by clicking...button), enter Subject and (optional) text, and click Send button. Recorded Calls This screen allows you to manage recorded calls associated with your extension. 15 Listen and Delete Recordings: To listen to a recorded call click on PLAY, and the recorded call will be downloaded and played (provided that you have appropriate player software). To delete a recorded call, select it using the check box on the left and click on Delete Selected. Forward Recordings: You can also send your recorded calls to other people via . To send recorded call(s) select them using the check box on the left, enter address into Send to field (or choose it from a list by clicking... button), enter Subject and (optional) text, and click Send button. Calls History This screen shows you the calls you made as well as the calls to your extension. You can specify a selection filter to be applied. You can filter by a range of dates, caller id, and source and destination. You can sort records by clicking on the headers of any column; clicking on the same header again reverses the sort order. 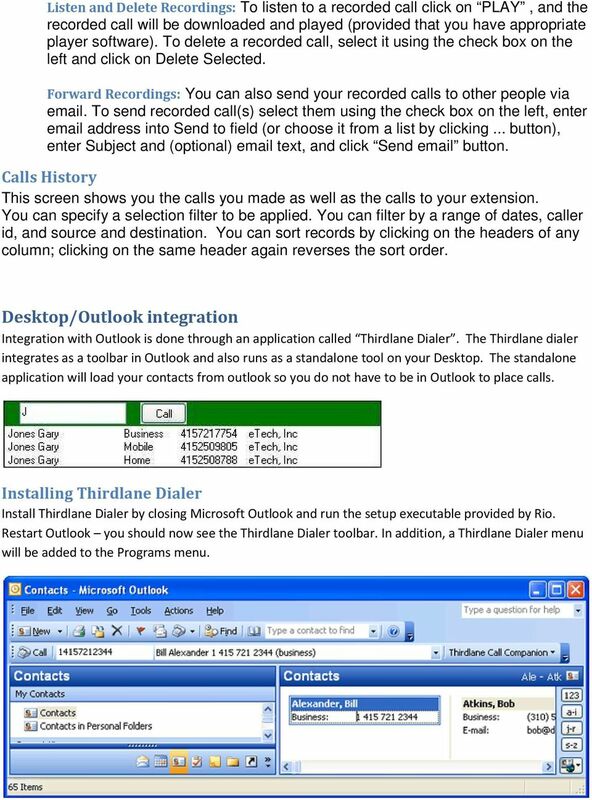 Desktop/Outlook integration Integration with Outlook is done through an application called Thirdlane Dialer. The Thirdlane dialer integrates as a toolbar in Outlook and also runs as a standalone tool on your Desktop. The standalone application will load your contacts from outlook so you do not have to be in Outlook to place calls. Installing Thirdlane Dialer Install Thirdlane Dialer by closing Microsoft Outlook and run the setup executable provided by Rio. Restart Outlook you should now see the Thirdlane Dialer toolbar. 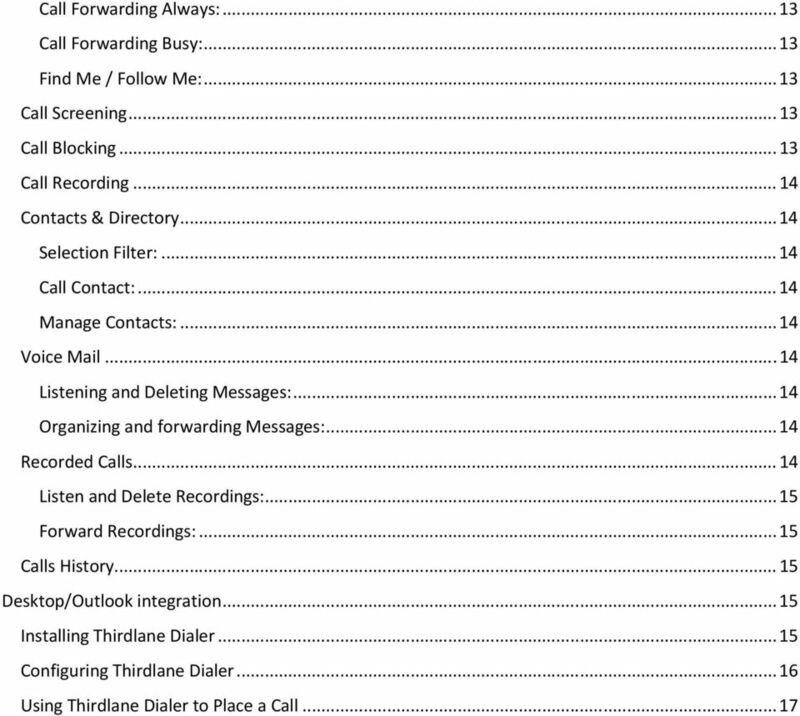 In addition, a Thirdlane Dialer menu will be added to the Programs menu. 16 Configuring Thirdlane Dialer To configure Thirdlane Dialer you can either right-click on the thirdlane phone icon on your Windows taskbar or by clicking on the dropdown menu on the Outlook toolbar. 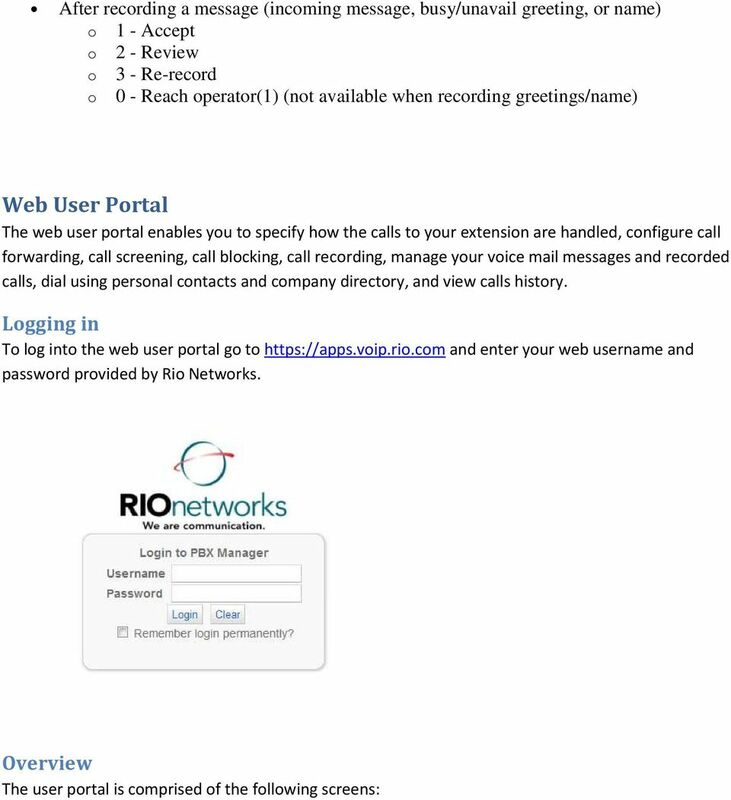 Once your there click on the connection tab and enter apps.voip.rio.com for the host with a port of 443. 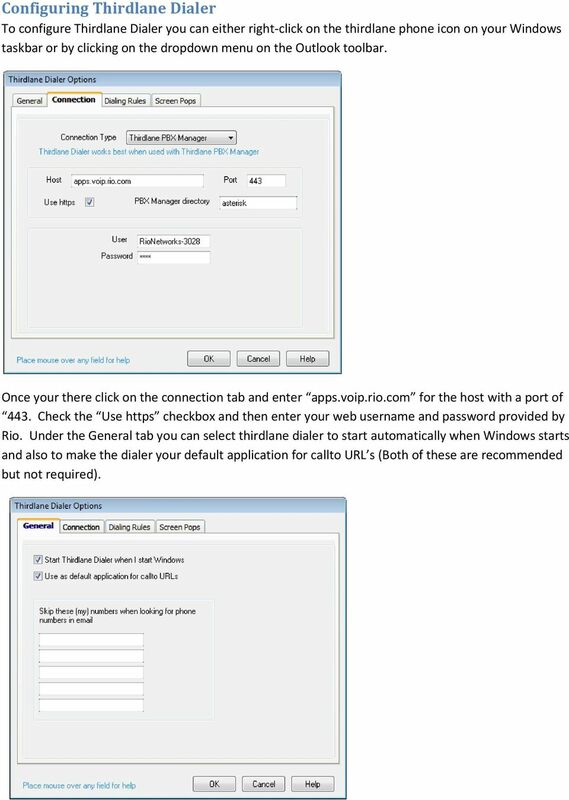 Check the Use https checkbox and then enter your web username and password provided by Rio. 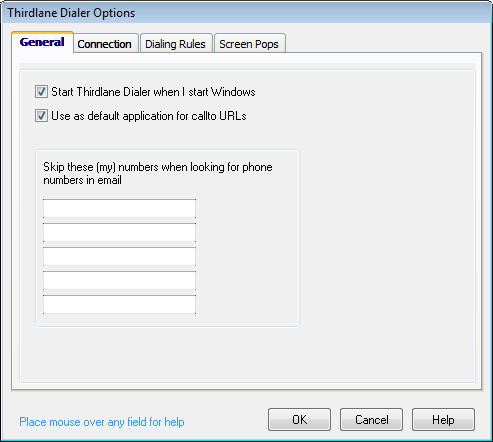 Under the General tab you can select thirdlane dialer to start automatically when Windows starts and also to make the dialer your default application for callto URL s (Both of these are recommended but not required). 17 Using Thirdlane Dialer to Place a Call To place a call simply go to the contact you wish to call and click on it once. The dialer toolbar will then show you a list of available phone numbers for that contact. Select the number you wish to call and the click on the call button. Once your phone rings pick the call up and then the system will call the requested party. 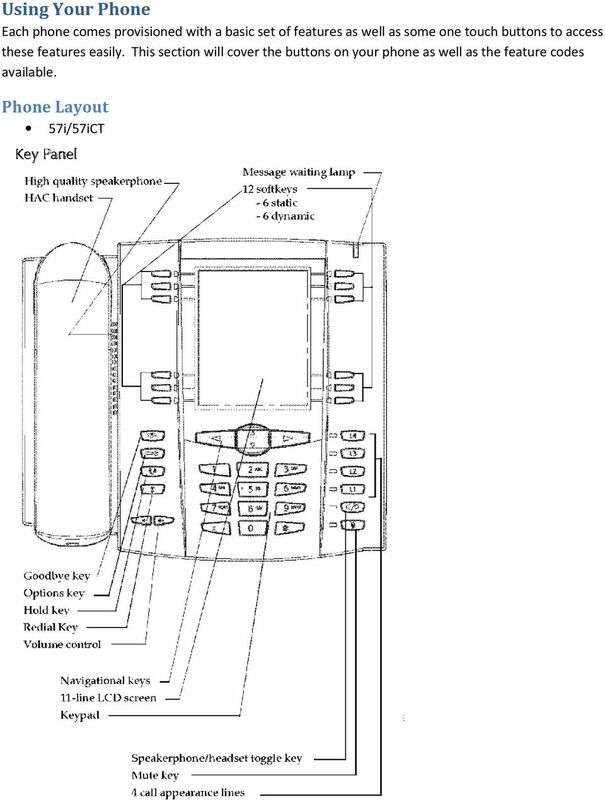 The dialer will also analyze s for phone numbers that it can call as well. If you select an the dialer will scan the for phone numbers and then display them in the dropdown menu of the toolbar. You can then place a call just as before by clicking the Call button. Thirdlane User Portal 2.1. Users Guide 05/12/2008. Third Lane Technologies, LLC 39 Power Lane Fairfax, CA 94930. http://www.thirdlane. Thirdlane User Portal 2.1 Users Guide 05/12/2008 Third Lane Technologies, LLC 39 Power Lane Fairfax, CA 94930 http://www.thirdlane.com Copyright 2003-2008. Third Lane Technologies, LLC. All rights reserved.